Four nights at Chinzombo exploring the 60 acres around camp which teems with wildlife, crossing the river by boat in to the heart of the national park and luxuriating in the elegance and comfort of the huge suites can be followed by four nights at Mchenja Camp or, for the more adventurous and wild at heart, spend two of the nights at one of our bush camps – Luwi, Nsolo or Kakuli for a taste of traditional safari. Meet our representative in Lusaka Airport where you will be escorted to your connecting flight to Mfuwe; the gateway to the South Luangwa National Park. Enjoy spectacular views from the air as you fly into the South Luangwa Valley, the flight takes just over an hour. On arrival at Mfuwe Airport, you will be transported to Chinzombo, where you can settle into your lovely suite. 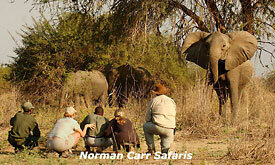 This afternoon after an excellent afternoon tea, you will participate in your first game viewing activity and night drive. Your second day will begin with an early morning game drive, giving us great opportunities to see the wildlife during the gorgeous morning light. You will return to camp in time for a sumptuous buffet brunch before having a few hours of ‘siesta’ time to watch the goings on from your room, take a dip in the pool or have a proper sleep! In the afternoons you will enjoy a delicious cake and tea/coffee before heading out on your afternoon activity where you’ll get to see magnificent sunsets, nocturnal animals on the prowl and enjoy a cool drink at a picturesque spot in the Park. Your day will begin with a filling breakfast at Chinzombo and then a game drive to transfer you to Luwi Bush Camp, giving you great opportunities to see the wildlife during the cooler morning hours. 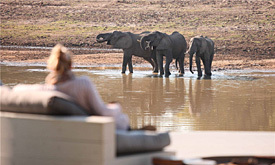 You will get to camp in time for a sumptuous buffet brunch before having a few hours of ‘siesta’ time to watch the goings on from your room, head to the nearby ‘hippo hide’ or have a proper sleep! In the afternoons you will enjoy a delicious cake and tea/coffee before heading out on your afternoon walk. During the next two days you will spend a lot of time on foot, exploring the area around the dry white sand Luwi River. A taste of sophistication awaits you at Mchenja. The last camp on the trail is set under the shade of immense ebony trees. 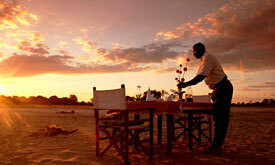 The five individually designed tents each have a bath inside as well as an open, en-suite shower and toilet. The main lounge houses a small plunge pool alongside the bar and sitting area and meals are usually taken on the river bank. 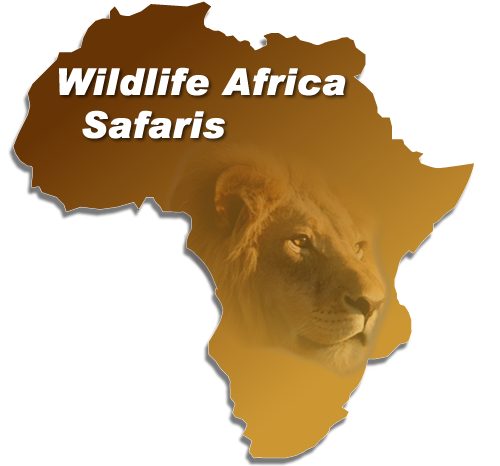 You will be able to do both game walks and drives and the wildlife viewing in this area is some of the best in the Park.